It may be February, but that doesn’t stop me from getting excited about all the spring collections coming out now. 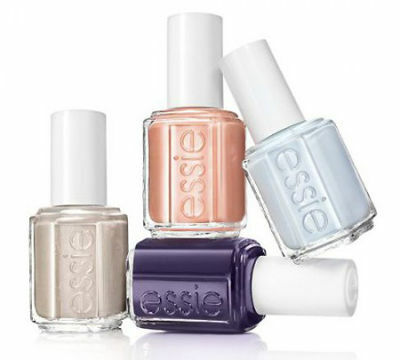 Among them are new nail polish colors, including Essie’s Resort 2014 collection. It consists of four colors: a very pale, almost mint-like blue, a light peachy coral, a sandy beige with a hint of shimmer, and a dark violet-blue. The shades are available both individually and as a set. This look is the epitome of spring, and perfect for a weekend outing or casual date. It starts with two perfect transitional pieces, a light coral maxi skirt and a white cable knit sweater. Next, add in a pair of tan suede booties and a pastel colorblock bag. For some glitz, pick out a bold jeweled statement necklace. Paint a few coats of Essie’s shimmery “Cocktails & Coconuts” on your nails for the finishing touch. As the days get warmer, break out this comfy and casual look for class. Some distressed boyfriend jeans look perfect with a baseball tee, while a pair of clean white sneakers lends a classic touch to the look. Add a fun, printed scarf that matches Essie’s dark violet nail polish for contrast. Lastly, throw your books in this bright, dragonfly-print backpack, and you’re ready for the day! For a spring-appropriate work/internship look, start with a pair of slim khaki pants and a pretty pastel blouse. A crisp white blazer looks polished and professional, while cute coral flats add a dose of personality. Polish off the ensemble with some classic pearl earrings and Essie’s peachy pink shade. When the evenings get warm enough that you can go bare-legged, give this going-out look a try. Pair a pretty purple skater dress with a beige moto jacket, and instead of traditional pumps, go for some wedge sandals. Accessorize with a beaded gold bracelet and gold stud earrings. For your beauty routine, try a peachy lip gloss and Essie’s pale blue polish, then grab this foldover white clutch on your way out the door. Do you like Essie’s new collection? Which look is your favorite? What would you pair with these nail polishes? Let us know in the comments!